Borneo Expat Writer: My Copy of Trois autres Malaisie has arrived! My Copy of Trois autres Malaisie has arrived! My copy of Trois autres Malaisie has arrived! The whole process, from the initial contact by Editions GOPE to explore the possibility of translating Lovers andStrangers Revisited into French to my receiving this copy took about one year. Although the cover is the same, it’s not—it’s better (though it's not as sharp in jpeg, above). But holding the books side by side, you'll see (and feel) the difference. The cover is now glossy, which makes the colors appear more alive and the woman more real; her exposed eye seems even more mysterious. The cover type is also bolder and stands out, though my name is smaller (on the spine, too). The thickness is about the same, even though there are three less stories; the height is shorter. Inside, other than the obvious language difference, you'll notice another big difference. There are ten illustrations from different artists and a hibiscus is used as a colophon (to denote breaks such as major scene changes). Also, in back, Editions GOPE, has added illustrations and a synopsis of several of their books, including Trois autres Thailande and Le Monde de Suzie Wong, the French translation of Richard Mason’s The World of Suzie Wong. This is good; it means that in future books and in new editions of past books, Trois autres Malaisie will be added, too. 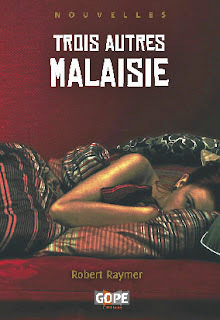 There is also Trois autres Malaisie translator, Jerome Bouchaud’s Malaisie: Modernite et traditions en Asia du Sud-Est. I'm going to get your book once I'm back in Malaysia! C'est exact, moi aussi je prefere la couverture francaise. It adds more class to it, doesn't it? Creative Writing Workshop—Torture or Fun?